So, it’s time for a new pair of running sneakers and you’re after the top rated and best ones that you can buy at a good price, right? Well you’ve come to the perfect place and the right shoe site. When it comes to choosing running shoes, there is indeed a wide range to choose from. From price ranges to brands and types, the vast choices can even make shopping for running shoes become overwhelming at times. 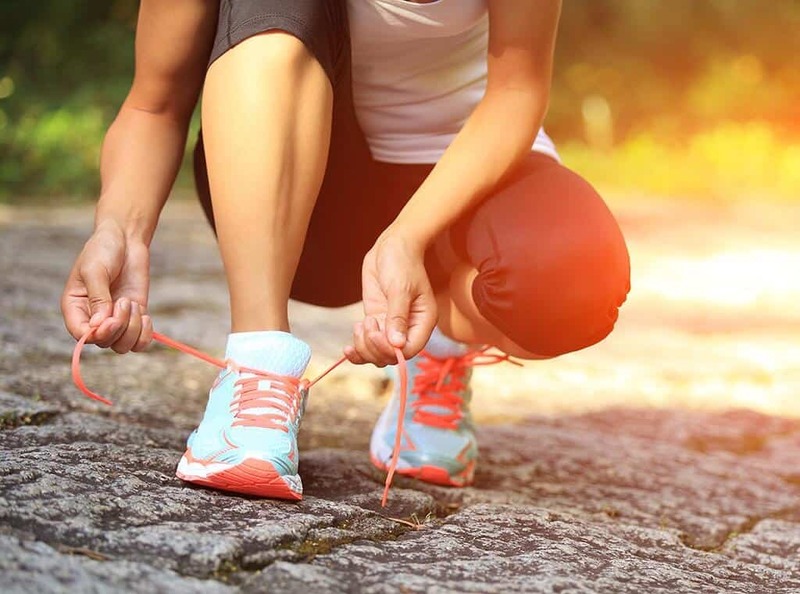 Whether you’re going for a mud run, a marathon or just using a treadmill, it’s essential that you’re wearing the best running shoes that’s perfect for you and your budget. By bringing you comprehensive, informative and unbiased reviews we aim to take the stress away and time wasting out of reading through reams of technically useless jargon. In this section we’ll do our very best to help you understand what to search for in order to find the best shoes for running. Pros and cons for each pair will be included as well. Please do read on what we have prepared for you, this includes some of the latest running shoe reviews of the top products which are famous and hot on the market this year. The Nimbus by Asics has been known to cater to every any-level-runner’s needs. We guarantee you that Asics sneakers offer great value for money; they are very reliable, established, and stylish too. 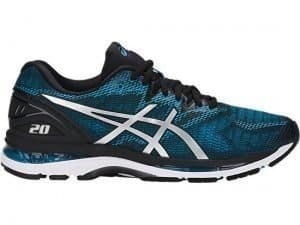 The Asics Gel Nimbus 20 is one of those continually successful design products in their range which is a development to the previous Nimbus versions. They are best used on roads, treadmill, and flat surfaces. This pair will also truly work wonders from easy paced trainings to full marathon distances. If you are also particular when it comes to looks, the Nimbus 20 will not disappoint. It is made with a modern engineered mesh with high-density printing that makes the pair look really cool and sharp. If you’re after a pair of the most comfortable running shoes which are gel cushioned, light, responsive, supportive and durable all in one, these are definitely worth a shot. This pair is also available for both men and women. Many neutral runners love how this bad boy can take enough of a beating and would still be great and feel comfortable after a couple of long runs. The upper of the Ghost 10 boasts a seamless engineered mesh making it more breathable and super flexible. This design hugs your foot where it’s needed and splays a little where you want it to. On every Ghost model, a guiding eyelet is always added on the tongue to keep it secured and locked during intense and long runs. On the Ghost 10, another eyelet is added on the other side of the tongue. Most runners who enjoy this pair claim that this addition adds more support and keeps the tongue secured in place during runs. The Ghost 10 boasts good quality materials with a premium and cool looking built. So, if you are someone who is in for a pair of neutral trainers or runners that can be used not only during runs but also on workouts, this might be the pair for you. This model is also available for both men and women. 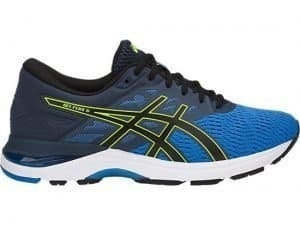 Many runners are very happy with the performance of the Asics Gel Flux 5 when it comes to a great deal of running. Its lightweight built and eye-catching design is truly admired by many people. The Asics Gel Flux 5 is not only about the looks since this pair is created with great support, stability, and comfort. This pair also boasts comfortable gel midsoles and a breathable upper mesh upper making is perfect for long distance running and as everyday training shoes. When it comes to responsiveness and flexibility the Flux 5 never disappoints. So, if you are looking for a pair of running shoes which is both functional and affordable, the Flux 5 will work great for you! Many runners love this pair of vibrant shoes, especially the triathletes. The Asics Gel Noosa is great in providing smooth transitions from run to bike. Not only that this pair boasts a couple of great features, it also looks very vibrant and colorful, they glow in the dark too. It is a shoe that could make you want to wear it and run happily. Many runners find the Noosa Tri 10 very enjoyable and reliable as well, despite the heavy colors and design, this runners are indeed very lightweight. They have a remarkable cushioning system and support. This feature packed triathlon-specific advanced design doesn’t limit its usage; it’s often seen to be worn whilst working out in the gym and dancing in Zumba classes; generally it’s fit for all uses. It has a seamless construction, open mesh upper, elastic laces, and advanced impact guidance system which improves the foot’s natural gait. The 860v8 by New Balance is created with road running in mind and at the same time giving importance to responsive cushioning and reliable support. Stability is being featured as a very important factor when it comes to the 860v8. This pair is incorporated with a dual-density post to help maximize a stable ride during your run. Many runners love how this running pair supports steady long runs. Its appealing design, extremely comfortable construction, and stable experience. Although the 860v8 might be heavier than other top rated running shoes, this pair has been brilliantly engineered for longer runs. The pair will also never disappoint since they are made to appealing to the eyes and are very sturdy as well. Although these are men’s running shoes there is a heel measurement of approximately 1.25″ and a platform of 0.75″, both of which are designed to absorb impact which they manage to do extremely well with the gel cushioning system. There is a women’s version of the Asics Gel Venture 4 which is available in at least 4 color combinations and has a 1″ platform. We reviewed the pictured men’s version which felt like the most comfortable running shoes we had tried on in ages. After two weeks of flat out testing they still seemed solid and built like they were fresh out of the box. Plenty of bounce, still fit as expected and no sweaty feet after long runs. This all-rounder and will handle any trial and lives up to the trusted brand name. Considering Brooks specialize in this type of gear it’s no surprise that they make near perfect sneakers. Maximum stability, responsiveness and comfort are provided in the form of numerous patented technologies. These running shoes are also lightweight and stable. 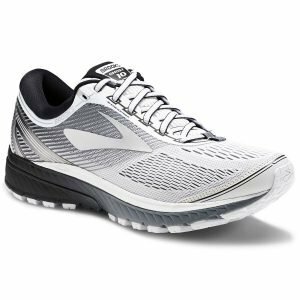 Additionally, the Brooks Adrenaline GTS 18 fulfills two rarities in our opinion, first is that they’re probably one of the best running shoes for wide feet. 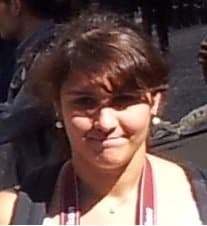 And second, they are extremely good looking! With some brands like Nike for example which run quite narrow, name brand sneakers which accommodate wide feet are hard to come by. So, if you have wide feet and want some trusted footwear, these are for you. The GTS 18 is also great for overpronators. The PUMA Tazon 5 is a smart looking great all-rounder; it’s not quite as niche compared to the above mentioned, but being a cross-trainer means they are good for a little bit of everything. Of the 1500+ positive reviews, 74% of owners say these fit as expected, but also mentioned they are slightly narrow and small toe box so be sure to select the correct option if you have wide feet. Lightweight and midsole cushioned, unrivalled stability in the form of technical innovation and revolutionary design, Puma sneakers are worthy of their good reputation, and the Tazon 5 lives up to their continually high standards. This running pair is best for every neutral runner. The Saucony Triumph ISO 5 is the top-of-the-line neutral trainer which many runners love. These shoes can truly offer tons of technology and cushion to log the long miles of running and training. When it comes to physical appearance, the pair might look a bit heavy and bulky but the color schemes are super great, making them very appealing. The Triumph ISO is not only great for running and training, but also for all-day wear since they are very comfortable and durable as well. The cushion of this pair is incredible too. As with the other brands listed here, Saucony are also top in this field. The Saucony Cohesion is one of those models from this respected name. Built from years of research on athletes, they offer good arch support and lateral stability. The low price tag make these a pair of cheap running shoes compared to the others, though we had much difficulty trying to fault them. Weighing only 8.6 oz., whether you’re tackling a 5k or a tough workout, the breathable mesh upper, durable synthetic supportive overlays, flexible forefoot, decoupled heel, all combined with the trademark fit, feel and performance of Saucony make this a highly recommended pair of running shoes for men which is additionally available in women’s option too. The Salomon Speedcross 4s are the sneakers you need in your life if you’re planning on a run through rough terrain like dirt or mud, or even snow! These stylish yet heavy duty trail shoes are perfect for gravel and trail type roads; they are comfortable and maintain excellent traction whilst providing comfort and dryness even for the tough mud. Wear these durable Salomons with pride; they look and feel indestructible, no doubt they will give you great value for money and pleasure for many usages ahead. Salomon X Mission shoes are an extremely lightweight and very impressive pair of trail shoes. With over 1200 positive reviews averaging 4.5, these come highly recommended for the trail runner. Although not as suited as others for long distance such as marathons, the Salomon’s are perfect for short to middle distances. The trademarked rugged outsole provides excellent traction; combine that with an innovative extra cushion for heel striking, and a breathable mesh upper, these X Missions are probably one of the best shoes for running along wet trails and mud runs. 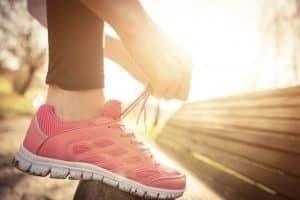 It is imperative that a footwear must be able to provide comfortable cushioning, but when it comes to running shoes this will play an even more important role. Cushioning is very necessary because the impact on lower body joints from running, whether it’s during a marathon or triathlon, is something that should be absorbed by good cushioning to avoid injuries. Most manufacturers such as Asics provide superior cushioning technology such as gel and other materials to accommodate this need. For obvious reasons a thicker cushion will generally be more comfortable than a thin one, but for some, a thinner cushion may work better. It is important to choose the right cushioning according to your preference. The shoe material and technology will truly play a big part when it comes to comfortable and efficient cushioning. We will help you go through each unique cushioning options since many brands have their own patented terms and designs to address this. Many runners especially the professional ones, prefer to use lightweight running shoes. A pair that feels too heavy, bulky, or has any kind of weighted feeling will cause you to exert more energy, eventually making you tired quickly and may slow you down. That is why you need to be sure to take this factor into consideration. The average weight of some of the best running shoes for women and men alike are usually anything between 6 oz to 5 lbs, with the average being approximately 2 lbs. Although 2-5 lbs isn’t a great deal of weight to carry on your feet, especially on short distances, but over long runs this can certainly have a big impact. It is important that you choose a pair that will not be too heavy especially if you do long distance running. A seamless upper is always good and comfortable. With a seamless running shoe, you get to enjoy a smooth and continuous construction without any obvious joins on the upper. This feature will help reduce irritation and pain during long runs. Any major joins can also lead to soreness or injury if the friction of a seam becomes too intense. That is why a seamless upper is always a good idea. Most of the best running shoes are seamless that is why this feature will truly be something to look out for since it helps you enjoy a more comfortable and happier run. What can a good runner do without a good shoe? Truly a good running shoe is a runner’s best companion. Running shoes that are able to keep the stride stable and balanced are considered to be good running shoes because they will keep you free from the common foot injuries and other worse effects. Accidents could be lurking in poorly designed and unstable footwear so make sure there is something in the specification which addresses this characteristic. For example, most top end brands will have some kind of guidance lines for improving balance and gait. Lateral stability is also a common term that refers to vertical ankle support which is important for every runner. Getting a pair of running shoes with great stability will keep you away from unwanted foot issues and injuries in the long run. As we all know, running shoes are generally unisex in their overall physical layout and concept, however, if anything is to differentiate them its normally the color. Running shoes for women are usually very colorful, bright and vibrant, or at least available in many different variations of style too. When it comes to the built and construction, they may also be slightly narrower, or fit tighter. There isn’t much price difference, but if anything, they may be slightly cheaper as women’s feet are generally smaller and can often get away with a children’s size which has a lower price tag. When it comes to choosing running shoes for men, it’s usually an opposite of the above. They tend to be more expensive (mainly because of the size aspect), also available in less colorful designs, and may be better at accommodating wide feet and comes with a wider range of sizes. Although the looks don’t make a difference to the performance of the sneaker, it’s nice to own a good-looking pair. Plus, they aren’t always cheap, so given the price, and considering your friends and co-runners will also be wearing similarly purposed footwear it pays to choose ones which look good. They often come in a multitude of various color combinations and funky designs and some even glow in the dark. However, be sure to let specifications and reviews take precedence over the aesthetics. If you are a running newbie who is struggling to understand the technical features of a running shoe, we are here to help you. We will discuss to you the anatomy of a running shoe and the important details and key areas you may need to know. 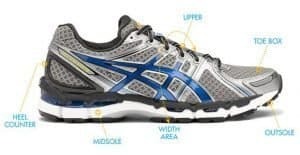 Every time you see or hear the description “upper” it is basically referring to the entirety of the running shoe that sits on the rubber sole. The following technology or features may be displayed here. 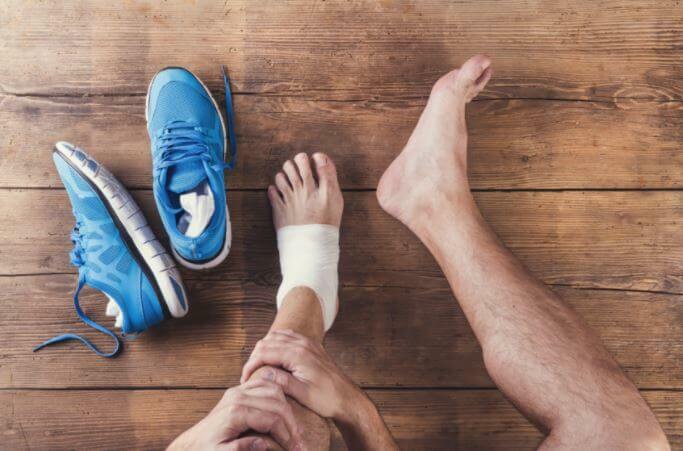 Innovations in mesh, the varying degrees and styles of tighter or looser mesh weave will hug and enclose your feet while avoiding extra friction and the resulting blisters. Updates in lacing and closures, the eyelet placement impacts how the shoe will lace and a runner can decide to loosen up or lock in. Reflectors, strategic reflectivity, various treatments in overlays, stitching, and logo placement all help with visibility if you run in low-light conditions or during night-time. The upper of a running shoe may also feature a single-piece construction or use hot-melt technology to replace traditional stitching for a seamless and more comfortable feel. The toe box is still included in the upper part of your running shoe. It is considered to be an important footwear zone since it is where your toes or the distal part of your feet will rest and be enclosed. Most brands put emphasis on how the toe box should be comfortable with the exact width appropriate for running. They concentrate technology to improve the toe-off stage of your step, which occurs when your heel has left or elevated off the ground and your toes are transferring force forward. Your legs move into a swing motion after the toe-off. A great to box should be built for easy and comfortable running that helps you push forward in easy and smooth motion while running. This part is very obvious and easy to see. The tongue of your shoe is not just there so that the laces could have a place to rest on, it has a couple of benefits too. If you notice that the shoe is made to have a mono sock fit, it is very likely the tongue is only constructed to be at the top part or the upper so that the whole upper may fit like a sock. A shorter tongue can prevent any movement or distraction from a tongue that may slip or move a lot. The tongue of many trail shoes are also often stitched or sealed to prevent from picking up gravel and features a lace holder to hold loose laces and effectively prevent tripping. The sockliner is basically what is inside the shoe and what is positioned nearest to your feet. The most commonly applied features or technology in the sockliner can be memory foam or moisture-wicking and even anti-microbial. This part of the upper is the reason why your shoes can feel great and comfortable on the inside. When it comes to orthotics, these sockliners can be removed to accommodate them. Many great running shoes are constructed with a heel counter or the rigid portion outside of the heel. This part is an exo-skeleton that wraps the heel or back of your running shoe and they are made to hold up against the impact that your heel experiences when running. The heel counter also stabilizes the shoe and helps it in keeping its shape. A key heel measurement that many experts and shoe enthusiasts talk a lot about is the shoe drop or offset. The shoe drop or offset is the difference in midsole height from the ground at the heel versus height in the forefoot. For example, if the heel height of a shoe is 23mm and the toe height of the shoe is 13mm, you have a 10mm drop. This is what has been considered as standard for running; you’ll see a lower number on training or racing shoes (6-9mm drops). Midsole, as the description implies, is the middle part of the shoe. It is a layer of rubber or a technical foam that sits in between the upper and the sole or the part of the shoe that actually hits the ground. The midsole may feature multiple densities and the differences in densities creates an impact on the shoe’s ride and feel. Cushioning, neutrality, and stability can be affected by the outsole. It is important that you look for a running shoe that creates a magnificent cushioning and stabilizing effect and never loses rebound after repeated and multiple impact. When you hear people or shoe enthusiasts talk about the outsole, they just literally mean the outermost part of your running shoe. The outsole is basically the outermost layer of rubber on the bottom of your shoe that comes into contact with the ground. Many brands features outsoles that are made of non-skid, high-abrasion rubber, or even trail-specific lugs to provide the best traction Features like high-abrasion rubber or trail-specific lugs provide traction for running in pavements and for trail and off-road running as well. A few brands also build gait guidance technology into the outsole and midsole. Understanding pronation is an important point when it comes to choosing the right shoe. So what is pronation? Pronation is the rolling of the foot from heel to toe through the foot strike. A proper or neutral foot strike pattern is initially striking with the outside of the heel and moving up to the ball of your foot evenly. This is how your foot reduces the stress of impact. Overpronation is described as too much roll to the inside of your foot during your foot strike cycle. This normally happens when you have a low arch or flat foot. Underpronation or supination is when your foot rolls too much to the outside. This typically happens if you have a high arch. The very basic foot types include the normal, low, and high arch. The easiest way to determine your foot type is to check your arch using water known as the “wet test”. This is done by wetting both feet and stand on a paper bag for about 10 seconds. Then step off of the bag and observe the imprint your foot made on the bag. Normal arch shows a distinct curve along the inside of your foot with a band a little less than half the width of your foot connecting the heel and toe. A low arch results to an imprint that shows most of your foot and there is not much of a curve along the inside of your foot. A high arch on the other hand shows a very noticeable curve along the inside of your foot and a very thin band connecting your heel and toe. If you have a really high arch, you may not even see anything connecting the heel and toe. There are four basic gait types, severe overpronation, mild overpronation, neutral, and underpronation. Severe overpronation is when your heel hits the ground first and then excessively rolls inward. This is typically someone with a flat foot or severely low arch. The best shoe type for an overpronator is a motion control shoe. Mild overpronation is described when the outside of the heel strikes the ground first and the foot then slightly rolls inward, still able to absorb the shock. This is typically someone with a low to medium arch and they should choose a stability shoe. When you have a neutral gait, the middle outward part of the heel strikes first and the foot slightly rolls inward, absorbing the shock. Someone with a neutral gait normally has a medium arched foot. The best shoe choice for a neutral runner is a neutral cushioning shoe. If you have underpronation or supination, your foot strikes the ground with the outside of the heel first and instead of rolling inward, stays on the outside of their foot through the entire foot strike. This inhibits the foot’s ability to absorb the impact of the foot strike. This is typically someone with a higher arched foot and should choose a neutral cushioning shoe as well. Where you will be running is something to be taken into consideration and is important. You choose the right running shoes based on your activities and their locations for appropriate support, maximum functionality, and most importantly to minimize injury. Road shoes are great for running on pavements and flat surfaces. If you are running on muddy areas like the mountains or forest, it is best to get trail running shoes. Also consider on how intense and how long your running will be. If you are someone who does a little bit of everything, hybrid running shoes are also available. Trying on the shoes is the last step. When trying on the shoes there are a few things to look for. Always make sure you have enough room in the toe and good width. Try to walk or run around the store to make sure there are no hot spots or slipping in the heel. Having the best fit for a running shoe is truly important and should not be taken for granted. Always take your budget into consideration. Getting a great running shoe does not mean you have to spend much. What is important that you get the pair that will work best for your running needs and will not damage your budget. The design may matter but it is important to consider the other important factors such as comfort, great fit, cushioning, breathability, and many more. Also choose the shoes not by looks but also by the type that would be appropriate for your foot conditions such as plantar fasciitis, flat feet, and for bunions. There’s nothing wrong in trying to get a great deal and get a great pair as well. It is always a great idea to enjoy deals and discounts especially in buying stuff that can be a bit expensive. Avoid buying shoes early in the morning. The best time to buy shoes is at the end of the day or late afternoon when our feet are at the largest state. Wearing the wrong size can result to injuries and painful blisters that is why it is very important to be very particular when it comes to the right sizing. Always ask the experts. We are here for a purpose, and that is to help you in choosing the best and perfect running shoes for you. After reading everything we have prepared for you, we truly hope that you finally made a choice. We have written unbiased reviews and information with the sole purpose of being able to take the burden of the difficulty when it comes to buying the perfect running shoes for you. Happy shoe buying!